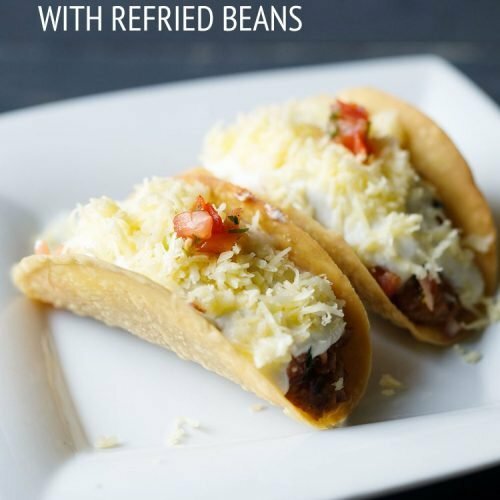 delicious and yum vegetarian tacos made with refried beans, tomato salsa and sour cream. taco is a traditional mexican recipe of corn tortillas stuffed with various types of fillings. then next day drain all the water. rinse the kidney beans very well in running water. then add the beans in a 2 litre pressure cooker. also add ¼ teaspoon salt. on a medium flame pressure cook kidney beans for 15 to 18 minutes. keep in mind that fresh beans cook faster. if the beans are old, then they take a lot of time to cook. when the beans are cooking, you can make the tomato salsa and keep aside. however do not add any salt or spices in the salsa as then the tomatoes and onions release water. add them in the salsa just before you start making the tacos. when the pressure settles down on its own in the cooker, then open the lid and check the kidney beans. they should be completely cooked and mash easily when you press them. drain all the water from the beans and keep aside. heat 1 tablespoon olive oil in a pan. lower the flame and add finely chopped garlic. you can even add more garlic if you want. fry the garlic for some seconds till its raw aroma goes away. no need to brown the garlic. add finely chopped onions. stirring often sauté onions on a medium-low flame till they become translucent. then add the cooked kidney beans. next add ½ to ⅔ cup water or add as required. you can also add vegetable stock instead of water. let the kidney bean mixture come to a boil on a medium-low flame. with a vegetable masher, mash the beans when the mixture comes to a boil. at this point you can even stop cooking and allow the beans cool down a bit. then blend everything to a smooth puree with an electric blender. add ¼ teaspoon black pepper powder, ¼ teaspoon dried oregano, ½ to 1 teaspoon red chili powder (or cayenne pepper) and 1 teaspoon cumin powder. add cayenne pepper or red chili powder depending on the heat you want in the dish. so you can add spices and herbs as per your taste buds. you can always add more or less of each spice and herb. on a low to medium-low flame continue to stir and simmer beans for 5 to 6 minutes till it thickens. you can make refried beans thick or with a slightly liquid and flowing consistency. add more water for a slight liquid consistency or if the beans look dry. when the refried beans have thickened to the desired consistency then switch off the flame. keep aside. remove the taco shells and place them on a baking tray. preheat oven at 100 degrees celsius for 2 to 3 minutes. place the taco shells in the oven and heat at 100 degrees celsius for 2 to 3 minutes. this step is optional and can be skipped. do heat the taco shells as mentioned on the package. gather and assemble all the ingredient required for the stuffing – taco shells, sour cream, refried beans, grated cheddar cheese (optional) and tomato salsa. you can even use fresh curd or yogurt instead of sour cream. take the taco shell. if the shells are too thin or papery, then take 2 taco shells. thin shells will break easily with the weight of the stuffings. pour a few spoons of refried beans on it. top with tomato salsa. you can even make guacamole and add it as a filling. now top with 1 to 2 spoons of sour cream. fresh curd (dahi) or yogurt can also be used instead of sour cream. top with some grated cheddar cheese. make all vegetarian tacos this way and serve immediately. i have used store brought taco shells. you can even use tortilla or whole wheat chapatis.